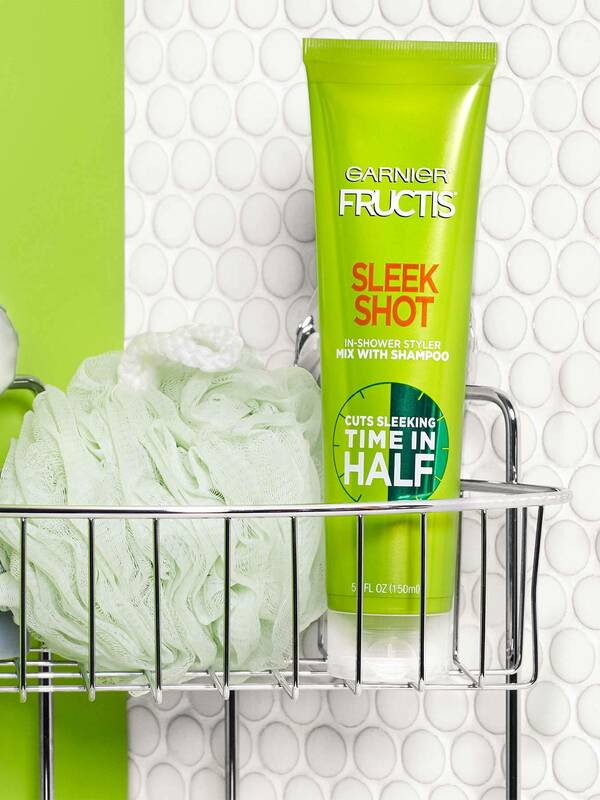 Garnier Fructis Sleek Shot In-Shower Styler brings styling into the shower to cut your sleeking time. Faster, easier blow dry styling, so you can skip the flat iron. Our in-shower sleeking technology with Argan Oil & Plant Protein wraps every hair strand evenly from root-to-tip, leaving behind just what you need with no residue for your smoothest and fastest sleek look. 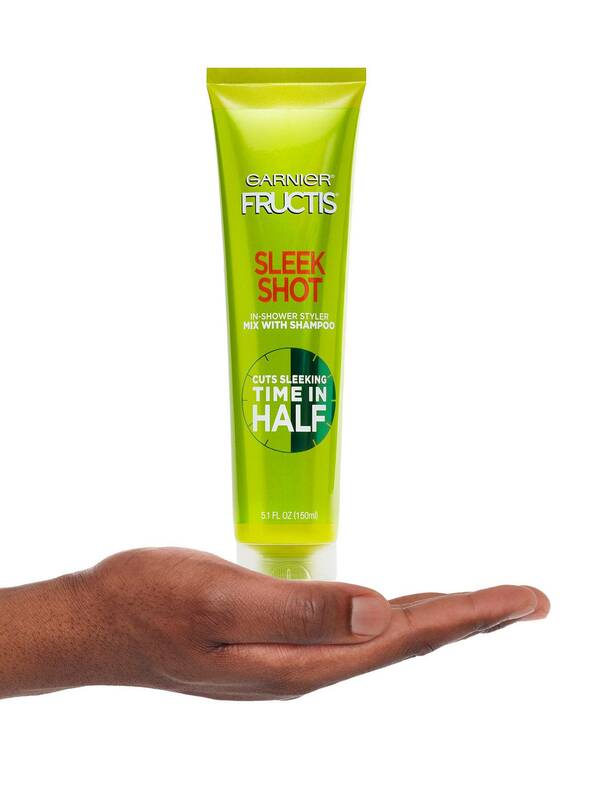 Add Garnier Fructis Sleek Shot In-Shower Styler to Sleek and Shine Shampoo at a 1 to 1 ratio. Rinse, condition, and style with blow dryer as usual. Get instant Sleek. Get Sleek hair faster because you can skip the flat iron. Get 24 hour smooth, shine, and frizz control. 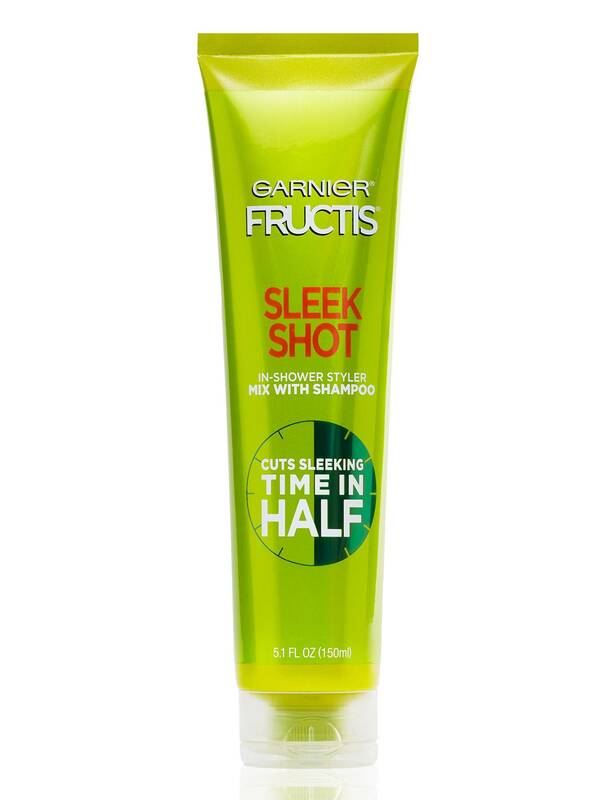 For your best Sleek, use Garnier Fructis Sleek Shot In Shower Styler with Sleek and Shine Shampoo, Conditioner, and your favorite Garnier Fructis Treatment and Styling Products. Get lasting smoothness with 24 hour shine with frizz control, and get better Sleek with a styling formula that covers every inch of your hair without residue. 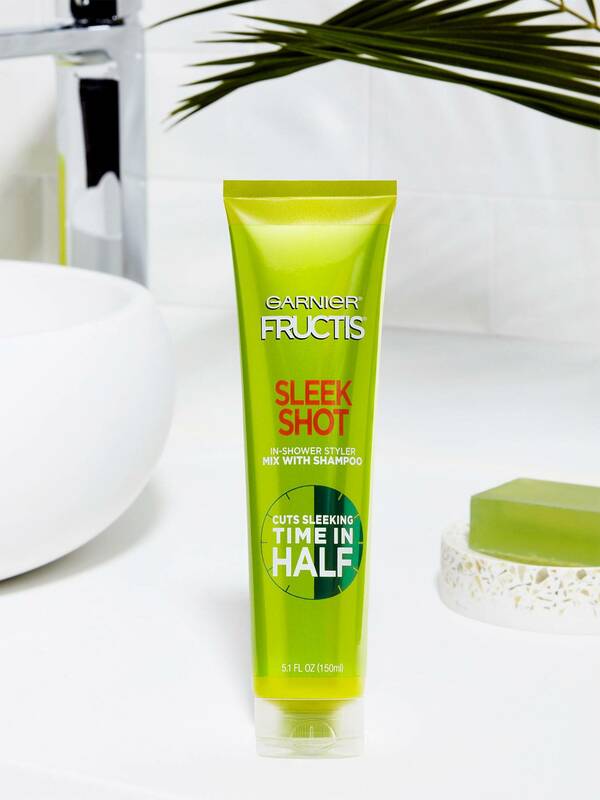 Add Garnier Fructis Sleek Shot In-Shower Styler to Sleek and Shine shampoo at a 1 to 1 ratio, then Rinse, Condition, and Style with blow dryer as usual. Rated 1 out of 5 by J Lee from didn't do anything for me It just didn't tame my frizz at all. I wouldn't spend money on it again. Rated 5 out of 5 by seymorelover from i dont even use a blow dryer! i love this stuff! works well even when you dont use a blow dryer! it still cut my hot iron styling time to mere minutes! Rated 5 out of 5 by riellyst from Better than a flat iron! Love this product! Does exactly as claimed. Smooths hair and eliminates need for a flat iron. When I would use a flat iron to smooth, hair would not hold a curl with curling iron. This way, it smooths the hair and the curling iron will still leave a beautiful curl. My only wish is that it came in a different dispenser. After the 1st couple of uses, it is very difficult to squeeze it out of the tube. Wish it had a pump dispenser or something easier. Still a fabulous product though! Rated 5 out of 5 by KristyB87 from Saves Time! My hair is always kinda straight but it tends to get unruly. Being able to use this in the shower is super convenient! It cuts down on drying time, and I only have to spot use my straightener now instead of taking forever to straighten it all. Love love love this product!! Rated 5 out of 5 by Krish1 from I highly recommend this product This product is great. Very strong hold. Smells great. The bottle is very compact. Easy to use. Works well. Highly recommend this product. 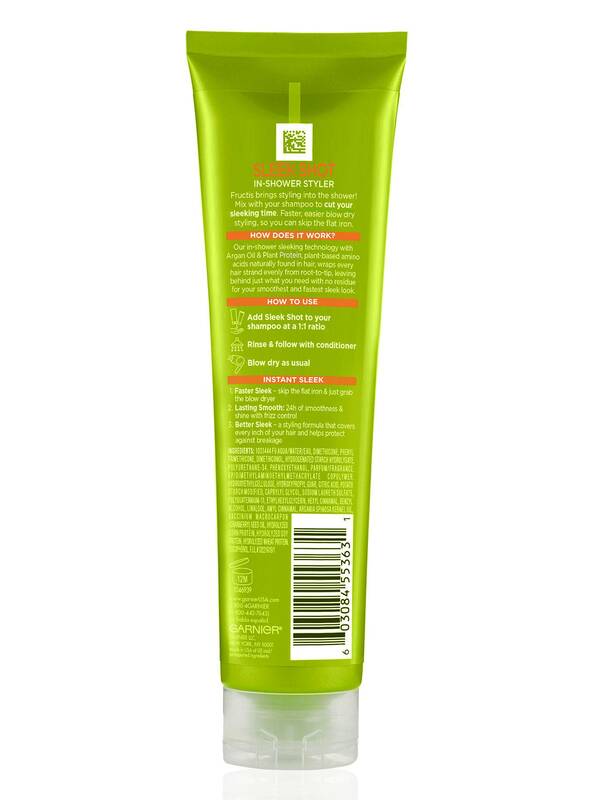 Rated 5 out of 5 by sierra_kathleen_ from This gives your hair a boost between washes. It's like a little extra pick me up when your hair falls flat. Rated 5 out of 5 by joyholland01a53bfb from Smells amazing and makes my hair soft and smooth! Will buy again and tell my family and friends too as well! Fair price also! Rated 4 out of 5 by norabek225 from I enjoy using garnier products all the time. The results are great and it isnmy go to item. My hair is a dark brown and curly/wavy and this worked fine.